From me to you: Make a pillowcase! 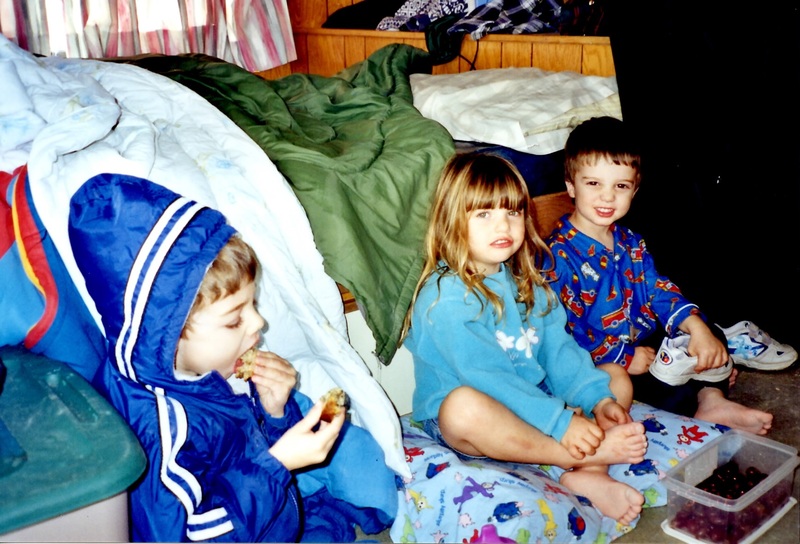 Back in the day, I made a Teletubbies pillowcase for my son. He loved it – he treasured it for a couple of years. My other son was meanwhile enjoying the store bought 101 Dalmations bed set, just so you know he wasn’t neglected. Go to your local store where materials are sold such as WalMart or JoAnns, and you will find a whole new world of options: Animals of all types (real and cartoony), holiday themed prints, fairies, princesses, flowers, specific sports teams, and copyrighted Disney characters. What did I find for my boys? Dinosaurs and construction equipment galore. Jackpot! Worried about your sewing skills? Don’t be. I’m not an expert seamstress. 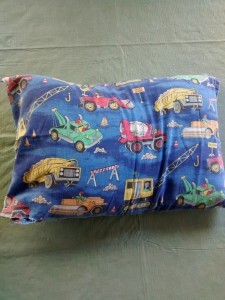 Out of all the things one can sew, a pillowcase is probably one of the easiest, even if you don’t have a sewing machine. If your work is not up to par, your child probably won’t notice. But just in case, here is a handy tip from me to you: Don’t sew ALL the edges together or you will be left with a pillowcase malfunction. Handy tip #2 – buy a “travel pillow” – it is the perfect size for a toddler, and you’ll need even less material. A yard of material is dirt cheap compared to your limited selection of pricey bed sets, and you can almost bank on the idea that toddlers don’t know that bedding should match, and really, why should it? Where is the fun in that? Live a little! Alternatively, if you are “one of those people” and just can’t function without the matching set, you can take it a step further. 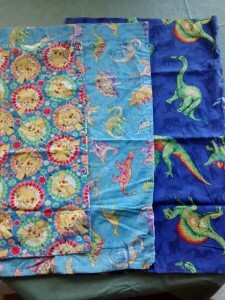 I actually made (er, um, yeah) dinosaur blankets. 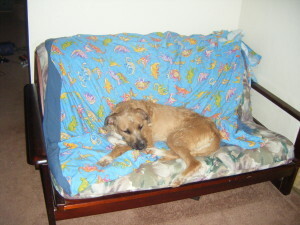 Okay – I didn’t MAKE the blankets. 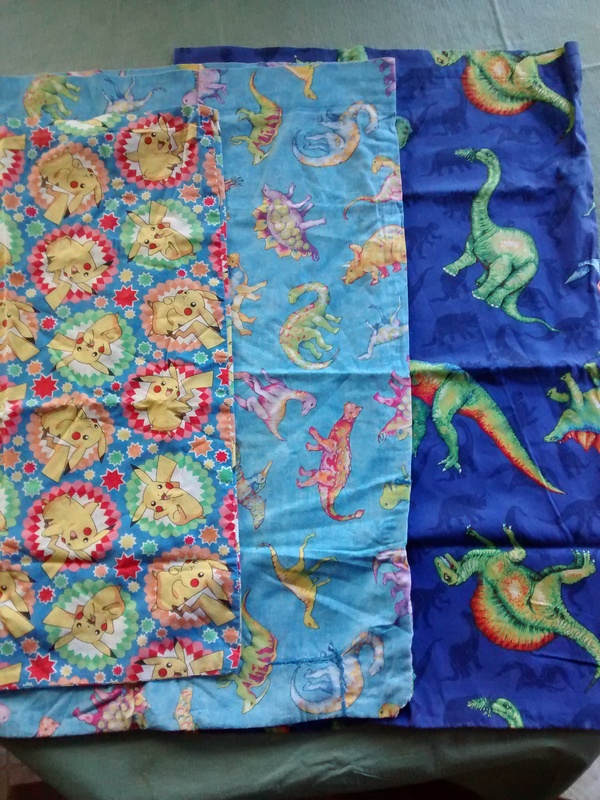 I bought really cheap blankets and then covered one side with dinosaur material and used a plain blue cheapo material on the other side. In retrospect the plain blue material was more difficult to deal with since it was very stretchable. Tip #3: If sewing is not your thing – don’t buy anything too stretchy. That same young man is now an older teenager. Out of the numerous pillowcases I made for him, he still has (in his closet) what is now an old, raggedy pillow with the construction print pillowcase. He is not willing to part with it. It is a keepsake of his. Oh my gosh, how worth it is that? So pick a print, apply your skills and give the gift of a pillowcase! Tip #5: Don’t forget to include a pillow. Tell me how it goes. . .